PRO QUALITY RECORDINGS FOR YOUTUBE, DICTATION, INTERVIEW, and VIDEO CONFERENCES - looking for a high-quality microphone system for your professional recordings? The RockDaMic professional lavalier microphone is your affordable, reliable and easy to use toolkit to record professional audio on the go. Whether you're looking to try a new song in your home studio, or communicate with your peers through video conferencing technology, this accessory will not disappoint. COMPATIBLE WITH YOUR PC, IPHONE, WINDOWS & ANDROID DEVICES - do you want an on-the-go microphone that can work with all your gadgets? The RockDaMic lavalier lapel microphone is designed to work with your iPhone, iPod Touch, Blackberry, Windows or Android smartphone. 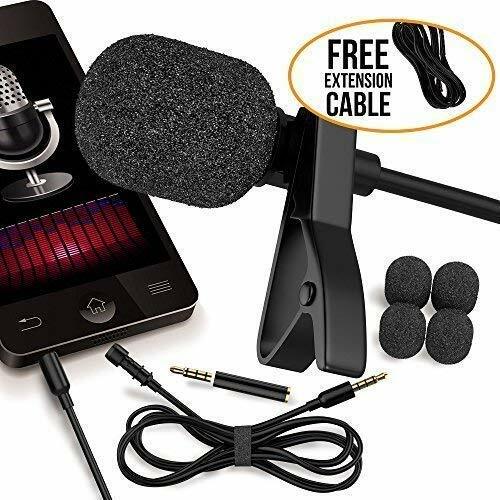 This makes it a dynamic audio recording accessory that you can use to capture clear, crisp and professional audio content at your convenience. If you have any questions about this product by RockDaMic, contact us by completing and submitting the form below. If you are looking for a specif part number, please include it with your message.